Park in between Route 250 and I-64 just before the entrance to Shenandoah National Park. This is the furthest southern hike that can be done in Shenandoah National Park before entering the Blue Ridge Parkway. The Appalachian Trail follows Skyline Drive on the thinnest part of SNP, ever wonder why it is not very wide at this point? Checkout this blog from our friend and fellow hiker Jeff, great job on the history of that last section of SNP. We did this as a 2 day backpack, camping at the Calf Mountain Shelter, roughly 8 miles out and 8 miles back. The views from Bear Den Mountain, Beagle Gap, and Little Calf Mountain make this a hike you will want to do. Mile 0.0 – The hike begins at the parking area in between Route 250 and I-64 just before the entrance to Shenandoah NP. Head north on the Appalachian Trail (NT), crossing over I-64 and in about 350 yards the Appalachian Trail will bear to the right. Mile 3.1 – Continue your climb on the AT over Scott Mountain, pass through 2 gates and 3 intersections, be careful and follow the white blazes at the intersections and in 3.1 miles reach an overlook looking west to Waynesboro. 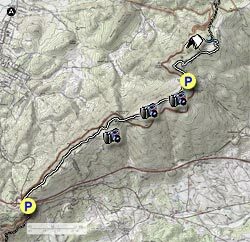 Mile 3.6 – After a steep descent you will reach McCormick Gap and then cross Skyline Drive. Note: On the return trip this will be a breath catching climb! Mile 4.5 – Climb Bear Den Mountain reaching the first set of Communication Towers. There is a good view to the east about 0.1 miles beyond the Towers. Mile 4.9 – Reach the second set Communication Towers. In front of the Towers is another great view. Mile 5.2 – Look for short spur trail on the right. Be sure to head in about 30 yards for great views. Go through fence, heading north on the AT to Little Calf Mountain, about 1.0 mile. Cross Skyline Drive, heading south on the AT to Bear Den Mountain, about 1.0 miles. 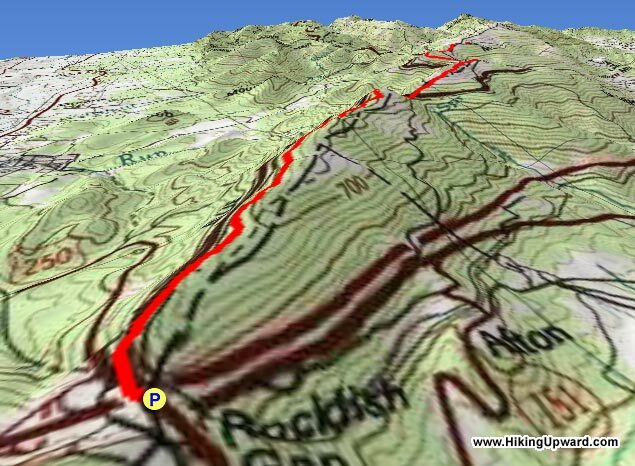 Mile 6.6 – Go through fence and head north on the new (8/2012) re-route of the AT to the beautiful meadow on Little Calf Mountain. Mile 6.9 – Reach Intersection of the old AT coming in from the right. Mile 7.9 – Continue hiking on Calf Mountain reaching the blue blazed Spur Trail to the Calf Mountain Shelter. Bear left onto the Spur Trail. Mile 8.2 – Spring on left before reaching the shelter. Mile 8.3 – Calf Mountain Shelter, has built in bunk platforms to sleep about 10 versus the normal 6 in most AT shelter. There are also about 6 obvious tent sites scattered around the shelter. Note: For return trip retrace your steps, heading south on the AT. Our distance going back was a little shorter (about 7.6 miles) due to it raining and taking no side trips. The trail maintainers have done an excellent job clearing the AT from I64 to at least the views at the 5.2 mile mark where I turned around (and the view there was great). Overall this hike was better than I expected. The trail itself is a great mix of hiking terrain with occasional views through the trees. I found another view around the 3.1 mile mark, just before the AT takes a dip down (not the big drop to the gap). If you look to the right up the ridge you'll see a clearing visible. It doesn't require any real bushwhacking to get up to it and once there, keep heading east. There are a set of rocks, an old wagon/trailer, and just about a 360 degree view. Hiked this over President's Day weekend. Loved the varied terrain of the hike (not 'just rocks' as some portions of the AT), and all the ups and downs were always rewarded with killer views. Caught a lifetime Top 10 sunset over the Calf Mountain Summit. Unfortunately, sunset at the summit meant the it was dusk coming down the backside, which made it impossible to find the offshoot for the spring and camping site (having to conserve water was a bigger issue than missing the shelter). My group and I passed the 8.6 mile mark, didn't see anything, doubled back, and still couldn't find it. By then it was dark so we gave up... but just be wary that apparently the shelter is hard to find at dusk, so plan on getting there in the daylight. We had a great time hiking into the SNP. This was my first time camping on the AT in the SNP. The trip was not too difficult for youngsters (we had 5 Scouts with us from 12 to 17), and we old guys did OK too. We could not easily figure out the old AT route around Little Calf Mountain--might have taken that on the return, but both days the view from Little Calf Mountain were great. We ate lunch at the tractor seats on Saturday (arrived about 9am at Rockfish Gap, started hiking at 9:10/9:20am with a few breaks). We had incredible weather for February with highs in the 70s and a low overnight of only 40. It rained briefly during the night. We tent and hammock camped near the shelter. Three other groups came in after us, so it was a popular spot. One stayed in the shelter, and the other two tent-camped. The spring was flowing really well. We saw many day hikers coming from each direction. There were a number of folks at the summit of little Calf when we arrived Saturday. I would definitely recommend this to someone who is looking for a little longer hike which is not super strenuous. It has some difficult parts, but overall is relatively easy with gentle ups and downs (coming up out of McCormack Gap on the return was tough, as advertised). Maybe an intermediate hike for someone who has already done a little backpacking (thinking mostly of the kids here). This was a total of 3.5 hours hiking into the shelter (we stopped a few times on the way in including lunch which made it take a little longer) and 3.5 back out (with no real breaks, it took us exactly 3.5 hours). This was my first winter hike and first solo trip. A bit more snow on the ground than I would have liked (I probably could have used snow shoes at some points) but making my own tracks from the second set of com towers on made up for that. The views from Little Calf Mountain were awesome. I ended up following the old AT on the way back to bypass Little Calf Mountain (the view is worth it once, but the new trail routing adds a lot, especially in snowy conditions). The shelter was in good shape and made a nice kitchen in the otherwise snow covered woods. The spring was just a trickle this time of year so I opted to melt snow instead. If you don't really want to fight the crowds of Shenandoah National Park I would highly recommend this in the winter. At times I felt like I had the whole park to myself. Nice hike with options to make it shorter if desired. Calf mountain summit and the communication towers/tractor seats were the highlights for me. The shelter had water and there was also a very small spring a few miles in. The shelter was two story which was cool!